Badges, bird scooters, beer and big smiles. That's what we found at this year's SXSW. First stop was the Comcast NBCU House. I walked by this beautiful, bold dress and when I looked up to compliment it, I realized the body wearing the dress belonged to Lupita Nyong'o! She and Jordan Peele were waiting to speak about their new movie, "Us," and were watching the audience fill in below them. Just a flight of stairs down from Lupita Nyong'o and Jordan Peele was a puppy pen with the most adorable puppies all ready to be adopted. At the Comcast NBCU House, the focus was a stage for panels to inspire and motivate, surrounded by hidden doors unlocking activations where you can transform yourself into a model (shoutout to the project runway studio booth) or unleash your inner hidden dragon in the "hidden dragon" virtual reality experience. Inside the Austin convention center, we saw impressive tech products and experiences. One of my favorites was a VR experience called "the time machine," that would place you into specific photos from history - like Japan in the 1960s. I had my own personal robot follow me around at the convention center. Another little robot friend had stars in his eyes, so I think he liked me. Walking on Rainey Street was a highlight of my SXSW experience. Houses sponsored by companies like Comcast, Snapchat and Lululemon and more had all different atmospheres. At Lululemon we saw a meditation dome. Amazon had a "good omens" tent. Never knowing what you'll find inside each house, we bopped around with our eyes peeled looking for any hidden interactive components, while also secretly hoping for treats like frozen yogurt. Each day I was in Austin, my team and I walked six to seven miles a day and were surrounded by people doing the same — or riding bird scooters, like Uber for scooters. The atmosphere at SXSW was relaxed, fun and forward thinking and it drew in crowds who were there to learn and have fun. Because of that, it was easy and exciting to make friends, like Erin Lim from E!, who gave me the "rundown" on SXSW. There was no shortage of food down in Austin! From tacos and queso to pulled pork and BBQ, we tried it all. I was definitely grateful for those 6-7 miles we walked each day. Each attendee at the Comcast NBCU House got two free drinks on their drink ticket, and could select from a list of drinks. The beer looked so refreshing on a hot day! You can bet we went back and had a beer after our shoot wrapped! 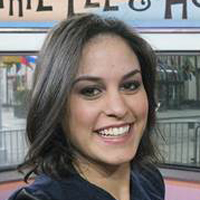 Donna Farizan is a producer for TODAY's fourth hour with Kathie Lee and Hoda.